Six years ago, Europe was different: ISIL, officially born in 2014, was still not menacing the continent and the far right was still not so powerful as it clearly is now. However, even then the Jewish people in the major EU countries felt that there was a threat on the horizon. According to a survey ordered by the European Union Agency for Fundamental Rights (FRA), in the Jewish communities of Italy, France, Belgium, Germany, United Kingdom, Sweden, Hungary, Romania and Latvia the increasing anti-Semitism and racism were clearly felt. As the demographer Sergio Della Pergola, one of the experts carrying out the investigation, explained in May 2013 to Pagine Ebraiche, “the most exposed countries are Hungary, France and Belgium, followed by Italy, where racism is significantly increasing, especially in Milan. However, among the concerns of Italian Jews, anti-Semitism and racism are firstly preceded by unemployment, secondly by the state of the economy and public corruption”. Six years after the social picture provided by Della Pergola, the European FRA decided to return to the subject, launching a new investigation regarding anti-Semitism from May 9, 2018. This time the countries involved are 14, having added Austria, Denmark, the Netherlands, Poland and Spain to the list. The survey is conducted by the Institute for Jewish Policy Research (JPR), an independent research institute, with headquarters in the United Kingdom, specialized in the contemporary events of the Jewish world, in cooperation with IPSOS. 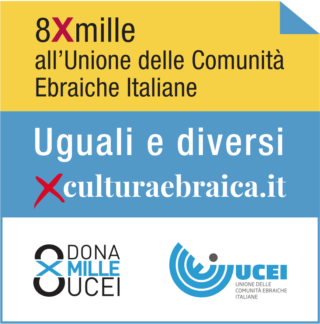 According to Della Pergola, who is carrying out the project again, together with a team of experts, “it is positive and encouraging that at the top of the EU institutions, or at least in the FRA, people realize that it is important to monitor and fight all forms of hate, discrimination and harassment, which certainly exist not only against Jewish people, but also against other ethnic and religious minorities. I am and I keep being very critical of the EU for its behaviour, but I praise the decision to invest money in order to obtain an overview of the Jewish perception of anti-Semitism”. For this reason, the demographer says it is “extremely important” that also in Italy the Jewish world anonymously fills in the questionnaires, which will be available on the website www.eurojews.eu from mid-May (there are three selection criteria: considering oneself Jewish, for religious, cultural, educational reasons, because of one’s origins or family bounds, or for any other reason; being 16 years old or more when filling the survey forms; living in one of the 14 EU member states joining the investigation). According to Della Pergola, “taking Italy, but not solely, into account, the feeling is that of various taboos being broken, which were still existing in post-war Europe: we say and read things that were unthinkable until a few years ago”. The most violent populist rhetoric is a clear example. According to the Israeli demographer, professor at the Hebrew University of Jerusalem, “the Italian central authorities have long been distant from that, but the political situation has changed”. “In the recent past, the highest authorities of the state have had a praiseworthy behaviour in condemning anti-Semitism in its several forms, and they were consistent in their position. Except for the President of the Republic, this cannot be said of the new political leaders, who seem to be much more unstable”. And this could be reflected in the Italian Jews’ perception of anti-Semitism in Italy. In general, the experts of the survey explain that “today anti-Semitism is still a problematic issue, not only for Jewish people, but also for all those who fight against hate crimes and discrimination. The way in which anti-Semitism manifests itself varies depending on the place and the historical moment, and it affects people of Jewish origin in different ways and to differing extents. In order to understand its current nature, this investigation tries to collect the direct testimony of people of Jewish origin living in Europe, regardless of the fact that they perceive anti-Semitism as a relevant problem or that they actually saw or experienced anti-Semitic incidents. In this way, the research team aims to gain a detailed and complex overview of contemporary anti-Semitism in Europe, as it is perceived and experienced by European Jews”. Moreover, the opportunity to analyze if and how the situation has changed since 2012 will be given to the countries where the research was already carried out, and it will be possible to have a clearer overview of anti-Semitism as a phenomenon. 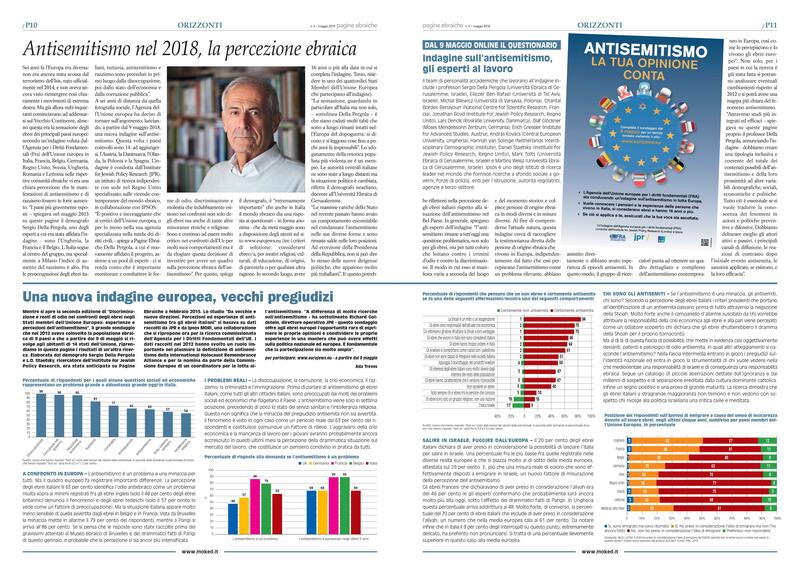 Announcing the investigation, professor Della Pergola explained to Pagine Ebraiche that “through more solid and efficient studies, we have to create an inclusive and coherent typology of the total amount of content about anti-Semitism and how close this content is to other demographic, social, economic and political variables. This is essential if we want to turn the understanding of these phenomena into both actions and prevention and defense policies. We have to better define the protagonists of the scene, those who have an active role as well as a passive one, the main dissemination channels, the reaction after the initial anti-Semitic incident, the sanctions, if they do exist, and their efficacy”. *This article was published in the May issue of Pagine Ebraiche and translated by Giulia Schincariol with the help of Anna Pagetti, students at the Advanced School for Interpreters and Translators of Trieste University, interns at the newspaper office of the Union of the Italian Jewish Communities.